Sunday saw the St. Louis Rams play the Washington Redskins in Washington. In the 2012 NFL draft these 2 teams got together and consummated a huge trade. The Washington Redskins gave up 3 first round picks and a second round pick. All this to move up 4 spots in the draft and eventually select Robert Griffin III, who by the way was not the starting quarterback on Sunday. With those picks received in the RG III trade the Rams have made the following moves and drafted the following players. The Rams received the 6th pick from the Redskins. They then traded that pick to the Dallas Cowboys for the 14th pick and another 2nd round pick. With that 14th pick the Rams selected defensive tackle Michael Brockers. The Rams then traded the 2nd round pick they received from the Cowboys to the Chicago Bears. The trade moved them down 5 spots in the 2nd round and netted them a 5th round pick in the deal. 5 spots later the Rams selected Isaiah Pead and the 5th rounder got them Rokevious Watkins, who was waived after his rookie season. The 2nd round pick they received from Washington turned into cornerback Janoris Jenkins. That was what they got that year, but remember, the Redskins also sent them their 1st round picks in the 2013 and 2014 draft. 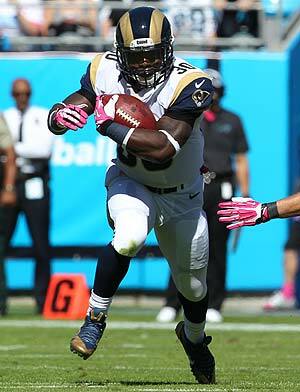 Rams running back Zac Stacy. In the 2013 draft they kept up their trend and traded that pick, which ended up being the 22nd overall selection in the 1st round, to the Atlanta Falcons. In that trade they moved down 8 spots in the 1st round and receiving an extra 3rd and 6th round selections from Atlanta in return. With their 1st round selection they selected linebacker Alec Ogletree and the 3rd round pick became receiver Stedman Bailey. You might be able to assume what they did with the 6th round pick they received from the Falcons, yes they traded it. They packaged that 6th round pick with their existing 6th round pick and actually moved up in the draft for a change to choose a running back by the name of Zac Stacy. But the Rams still were not done, in the 2014 NFL draft they used their #2 selection provided to them by the Washington Redskins to select offensive lineman Greg Robinson. Of those picks the Rams have 6 active starters, Jenkins, Brockers, Stacy, Bailey, Ogletree, and Robinson. In a humorous yet rubbing salt into the wound moment, Rams Head Coach Jeff Fisher sent those 6 players out to midfield to conduct the coin toss in the game against the Washington Redskins. The Rams then beat the Redskins 24-0 in the game and seemingly with the trade as well. The only other way this trade could get anymore ironic is if the Rams, who need a starting quarterback, would trade for RG III in the off-season and turn him into their franchise quarterback. Could it happen? It’s a coin toss.